The first Dutch formation of the year appeared on January 29th in a grass field near Bergen. This was an interesting multicircular formation that many Circle trackers were unable to visit prior to its removal. Was poorly advertised in the media and only a few images were taken aerially. On March 16th came a second formation, this time at Roosendaal. 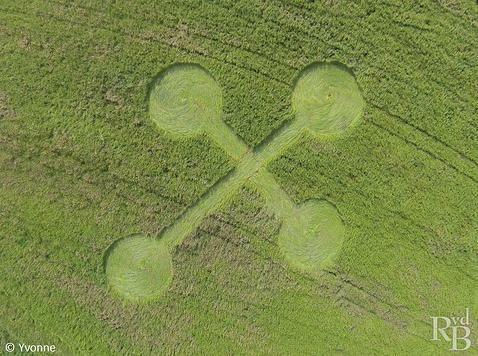 This was in a field with colza or mustard plants. On April 5th, the third formation appeared, in Hoeven. This one was strangely formed with large rings, circles, and a strange central square pattern. 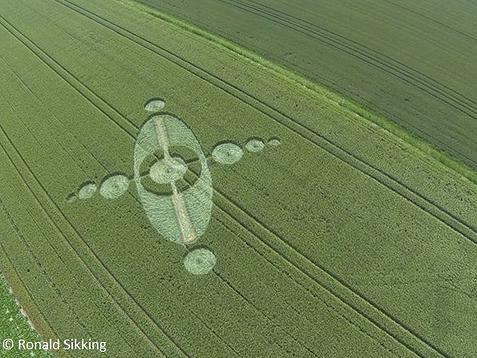 Reports from those that visited it indicated no disruption between the field in each individual shape, making it difficult for this to be terrestrial in origin. On April 8th the fourth formation of the year appeared, in Oudenbosch near Koksweg. This was again one of several rings, with circularly removed areas. Small dots trailing off similar to the one seen on the 5th. On April 23rd another formation appeared in Hoeven. This was different than previous formations in the area, with once again little disturbed areas connecting the various shapes. Unique formation, and again with rings. 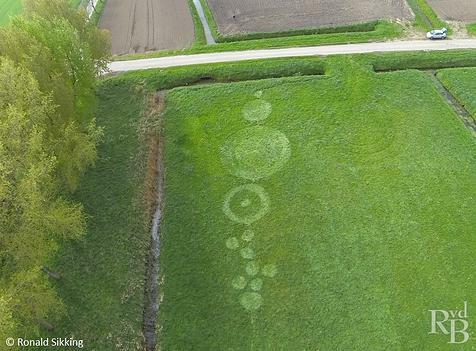 On May 7th this formation appeared in Strijpenseweg between Prinsenbeek and Zevenbergen. 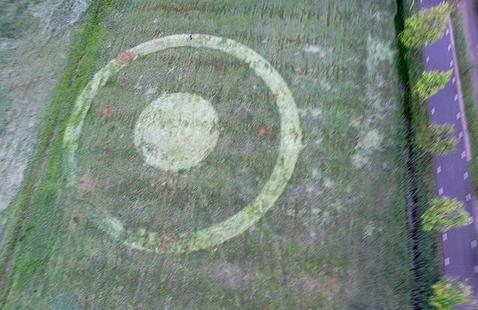 This was again a large ring with central circle like several others. On May 20th the seventh formation of the year again appeared at Roosendaal. 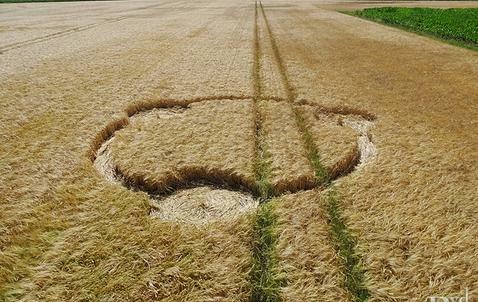 This one was formed again in grass. 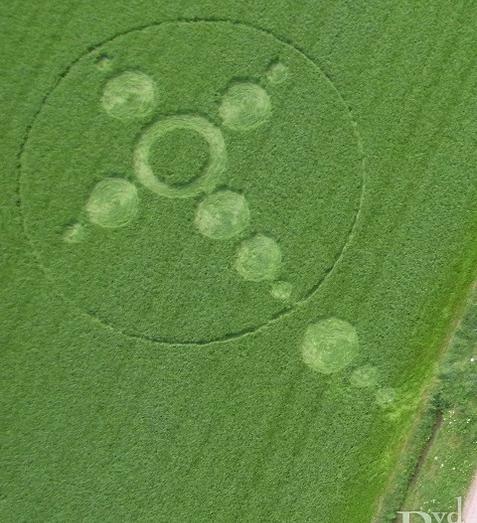 Large circles and a cross were again seen. Then on June 3rd, formation number 8 was seen again at Roosendaal. This area was seeing a particularly high level of activity this summer. 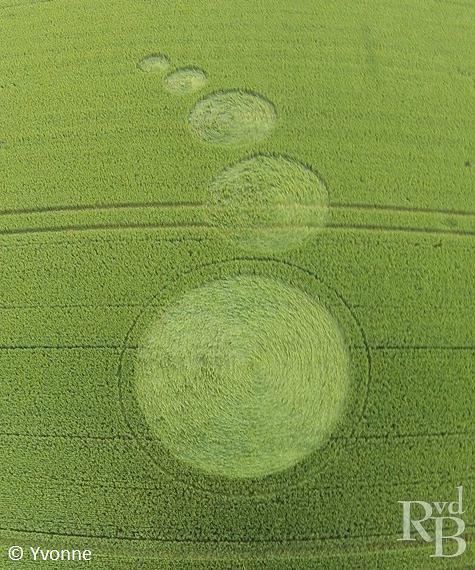 A lot of clear circles were seen in the field, with minimal paths between the circles being present. 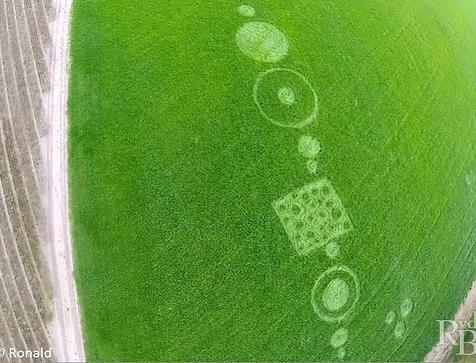 They appeared to be uniquely generated with no clear avenue for formation outside of aerially. On July 16th, there were more than 3 formations in one night! 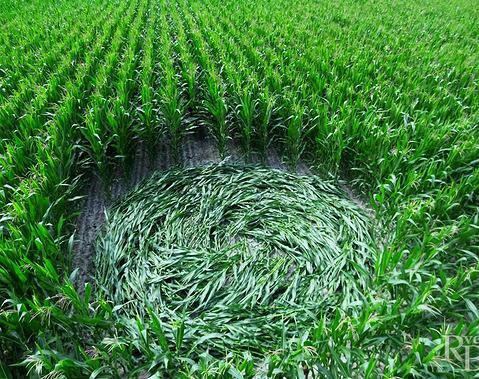 First, this simple but beautiful circle corn was found in Etten-Leur. This was the second one seen on July 16. 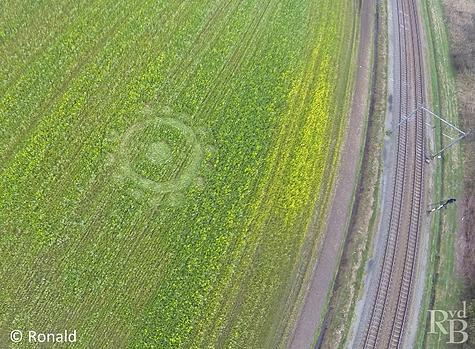 Once again, seeing a circular ring patter with inner circles in Roosendaal. The third one that appeared on this day was in Zevenbergen. 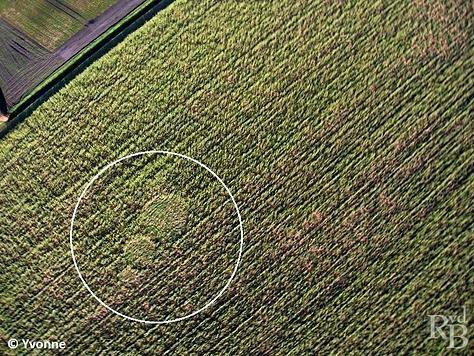 Once again large rings with central circles, a hallmark of most of the formations seen in the Netherlands this year. 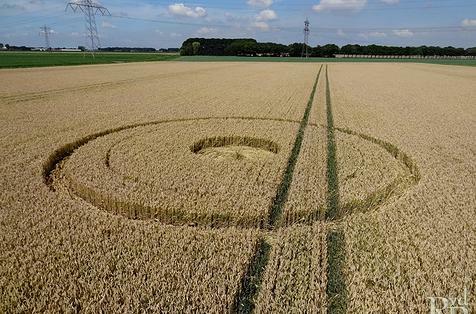 On July 23rd there were finally two more reports from another region in the Netherlands (then N-Brabant): one formation at Stadskanaal in N-GB and a simple circle in Bennekom (near Wageningen). The first picture to the right is the latter in Bennekom. Thanks to Jan Fokkens Janet was able to go to this circle first in Bennekom. She was nearby at the time, just around the corner really. 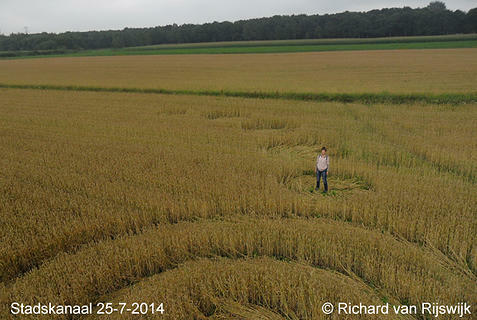 This was a very simple circular formation in the wheat. 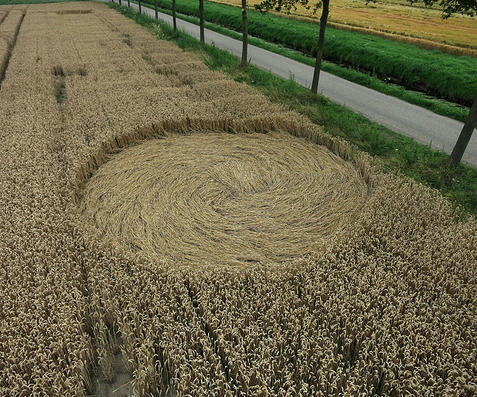 The second one in Stadskanaal was beautifully mapped by Richard van Rijswijk, and again fit the same ring and circles pattern we have been seeing throughout the Netherlands. Exceptionally beautiful location, with some of the best Circle Maker features available. Very exciting start to the year in the Netherlands, with formation after formation and significant commonalities between sites.